Newly elected National Chairman of the largest opposition party, the National Democratic Congress (NDC), Hon. Samuel Ofosu-Ampofo, has paid a courtesy call on the Chairman of The Church of Pentecost, Apostle Eric Nyamekye. Hon. 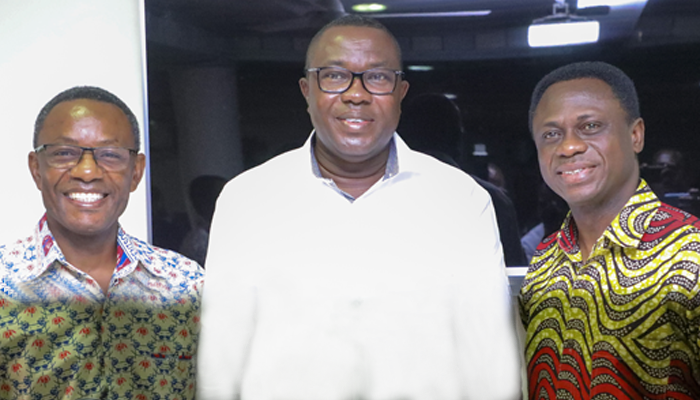 Ofosu-Ampofo, an Elder of the Church, was accompanied on Tuesday’s visit [November 27, 2018] by Hon. Mavis Ama Frimpong (former Eastern Regional Minister), Hon. George Kuntu Blankson (former Member of Parliament for the Ekumfi Constituency), and the Krowor Constituency Chairman of the NDC, who are all members of the Church, and some members of VOA (Vote Ofosu-Ampofo) campaign team as well some party sympathizers. He was at the Church’s General Headquarters to thank God on his successful election as the Chairman of the largest opposition party and to seek the prayer support of the leadership of the Church for divine wisdom in leading the party. Joining the staff in their morning devotion, Elder Ofosu-Ampofo attributed his landslide victory to the hand of God, and thanked the leadership of the Church for their prayer support. Recounting his political career for the past 25 years, the new NDC National Chairman said God has sustained him over the past two decades without any blemish. He therefore promised to handle his new position with dignity in order not to bring the name of the Church into disrepute. The Chairman of the Church, Apostle Eric Nyamekye, charged Elder Ofosu-Ampofo never to compromise his Christian values in his political career. He also admonished him to be the salt and light of his political party by leading it with integrity. Prayers were said for the NDC National Chairman and the nation. Present at the event was the General Secretary of The Church of Pentecost, Apostle Alexander Nana Yaw Kumi-Larbi.